Most Fort Worth residents are satisfied with city services, although they would like to see more emphasis placed on street and facility maintenance and public safety services. Those are the major findings of the latest citizen survey, conducted this spring by ETC Institute of Olathe, Kan. The survey's purpose was to assess residents' satisfaction with the delivery of major city services and to help determine priorities for the community as part of the city's ongoing planning process. Of the households that received a survey, 1,685 completed the survey. 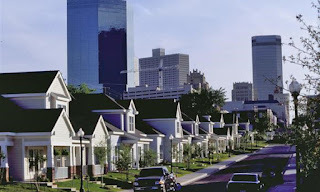 At least 200 households were surveyed in each of the city's eight council districts. More than three-fourths (76%) of respondents indicated they were satisfied with the quality of life in Fort Worth. 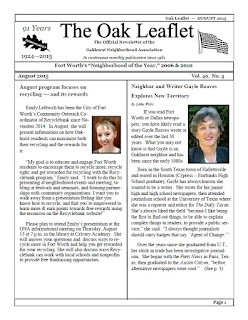 For more details, visit http://fortworthtexas.gov/news/2015/08/citizen-survey-results/. Finalists for Fort Worth police chief are expected to be announced later this week, and the public will have an opportunity to meet the candidates the following week. 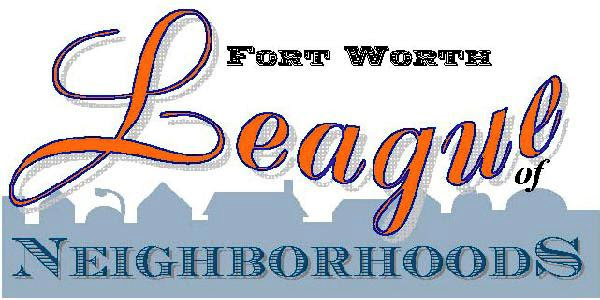 The Community Forum is planned for 7-9 p.m. Sept. 10 at the Bob Bolen Public Safety Complex, 501 W. Felix St.
For more details, visit http://fortworthtexas.gov/news/2015/08/meet-police-chief-finalist/. This is an important meeting; we encourage you and your fellow neighborhood leaders to attend. Public meeting TONIGHT to discuss proposed changes to residential zoning definitions. An upcoming public meeting will provide residents a chance to comment on proposed zoning definitions related to residential uses, including options for a new "single housekeeping unit" definition. After the public meeting, the Zoning Commission will conduct a public hearing and vote on the definitions on September 9 at 1 pm at City Hall. The City Council will conduct a public hearing and vote on the definitions at its meeting on October 13 at 7 pm at City Hall. Click here to view the pre-council briefing on this issue. Under Available Videos, scroll to Pre-Council, July 21, 2015; click and scroll to Item 11. 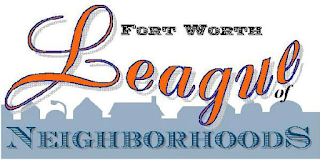 ALSO, PLEASE SAVE SEPTEMBER 28 ON YOUR CALENDAR AND PLAN TO ATTEND THE LEAGUE'S FALL GENERAL MEMBERSHIP MEETING—A CELEBRATION OF 30 YEARS OF THE LEAGUE OF NEIGHBORHOODS. DETAILS TO FOLLOW!